I first looked at Marvel UK's POCKET BOOKS line last year but I recently acquired a full run of STAR HEROES POCKET BOOK, giving me the ideal excuse to revisit them. 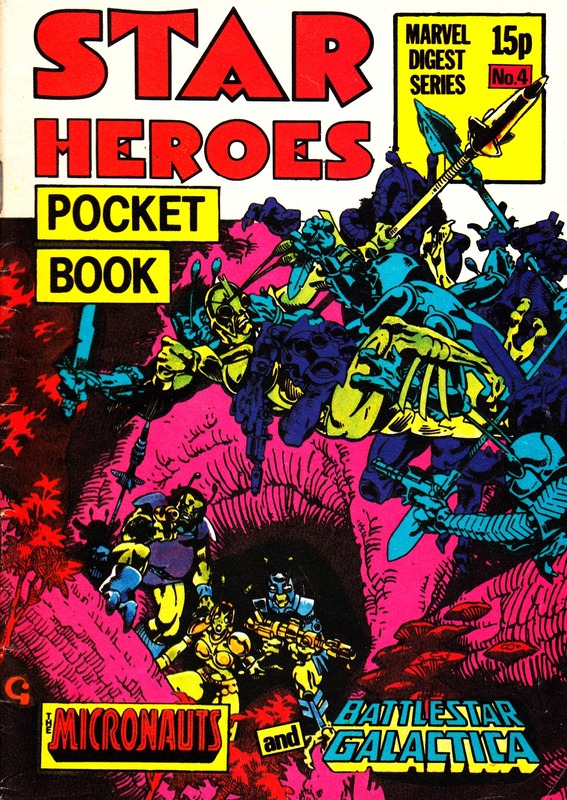 For latecomers (who can't be bothered to click back): Dez Skinn created the black & white digest-sized line in 1980 as an economical way (for Marvel and readers) to expand the British line. 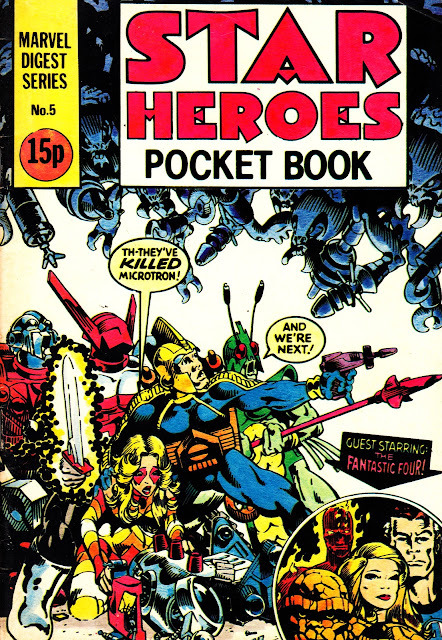 The smaller format was already well established in the UK thanks to the "pocket libraries" published by IPC and DC Thompson. 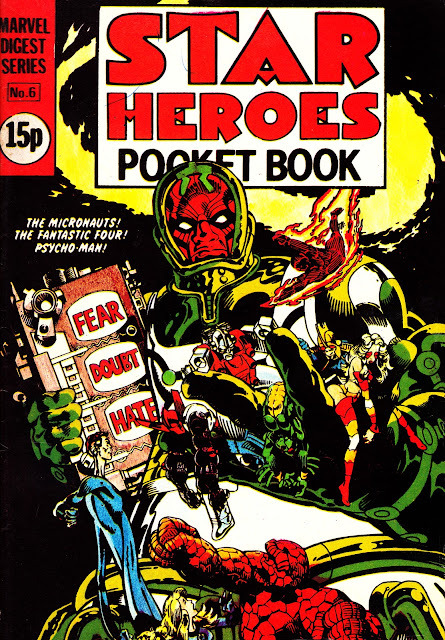 The Marvel UK books were all-reprint and most relied on archive material from the sixties, often a second (or even third) UK outing for the material (dating back to the Power Comics line of the late sixties). 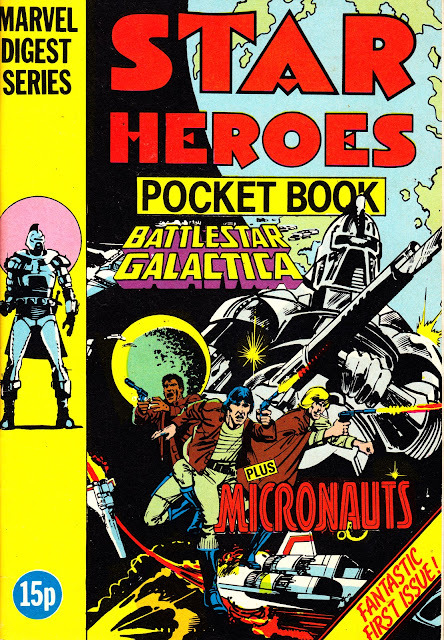 STAR HEROES was the one exception: it reprinted the contemporary strips THE MICRONAUTS and BATTLESTAR GALACTICA. The former, based on the toys, had already been given its (hyped - see another previous post) premiere in the pages of (the always desperate for suitable supporting features) STAR WARS WEEKLY. The latter was based on the TV show although, unless they read STARLOG, STARBURST or one of the other imported SF mags, the chances are most British readers only knew it as a series of movies and had no idea they were actually edited TV episodes. The Battlestar reprints kicked-off by rerunning the sixth US issue, the first to break away from TV adaptations in favour of a parallel continuity. Skinn had tested the formula (along with several other "heroes" formats including MARVEL SUPERHEROES and TV HEROES) the previous year with the STAR HEROES WINTER SPECIAL (notable for featuring an adaptation of the Battlestar episode Lost Planet of the Gods, a year before the two-parter hit British screens). The STAR HEROES line-up remained constant for the first eight issues before the Micronauts vanished without any warning or explanation. Reprints were also being serialised in FUTURE TENSE although Star Heroes readers would be none the wiser as no effort was made to tell anyone. Issue 9 was a double-length issue all-Battlestar issue (including a reprint of the infamous ex-Tarzan strip, clumsily reworked to become a Battlestar tale involving giant apes). 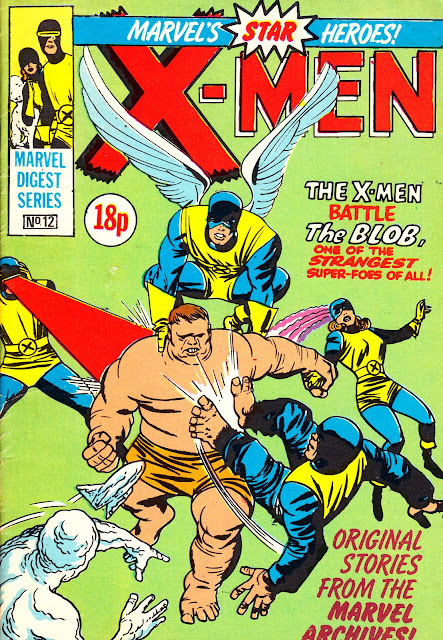 The Galactica reprints continued in issue 10 but the arrival of sixties Lee/ Kirby X-MEN reprints (the New X-Men were simultaneously appearing in RAMPAGE MONTHLY) signalled change ahead. This was (at least) the third time those strips had seen service in the UK (first appearing in FANTASTIC in the late sixties and again, in the seventies, in THE TITANS). I'm pretty sure the first X-MEN strip also surfaced in one of the late seventies/ early eighties hardback annuals although I don't recall which one. 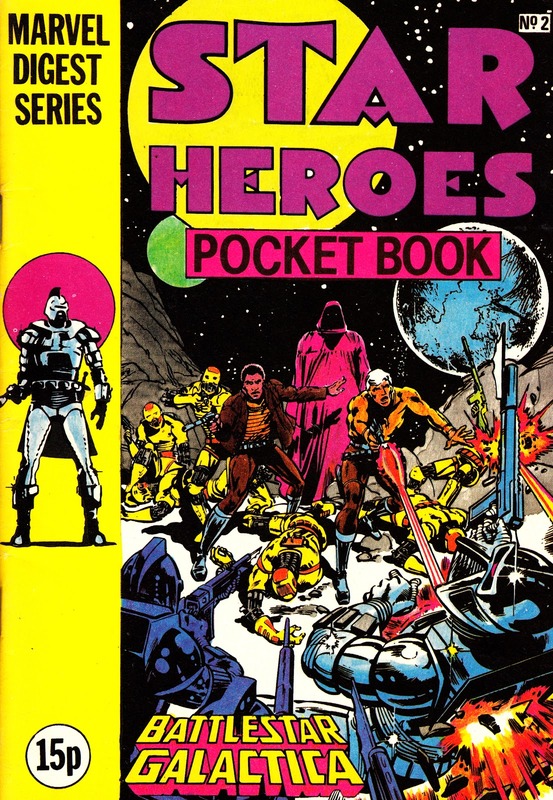 The last of the Galactica reprints appeared in issue 11 and from 12 it officially became X-MEN POCKET BOOK, albeit with the (meaningless) top line "Marvel's star heroes". The price jumped from 15p to 18p from issue 11 (without any of the usual editorial concessions to "rising prices"). 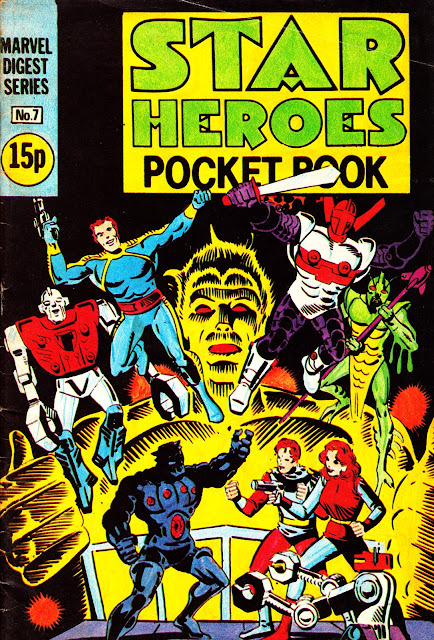 Another leap, to 20p, kicked-in from issue 17 and again, to 25p, from issue 21. 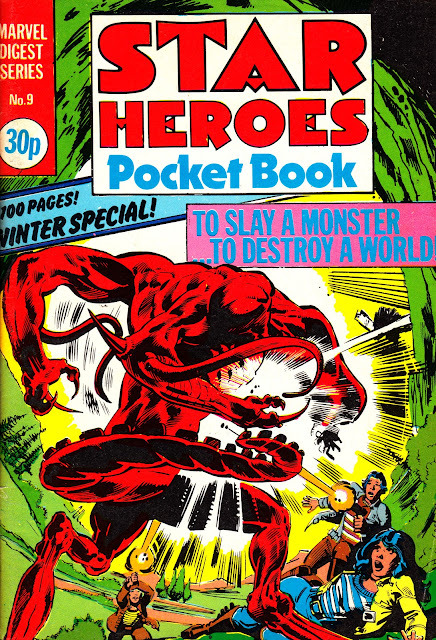 The double-sized 20th issue cost 40p. Such rampant inflation might help explain the demise of the pocket books a few months later. 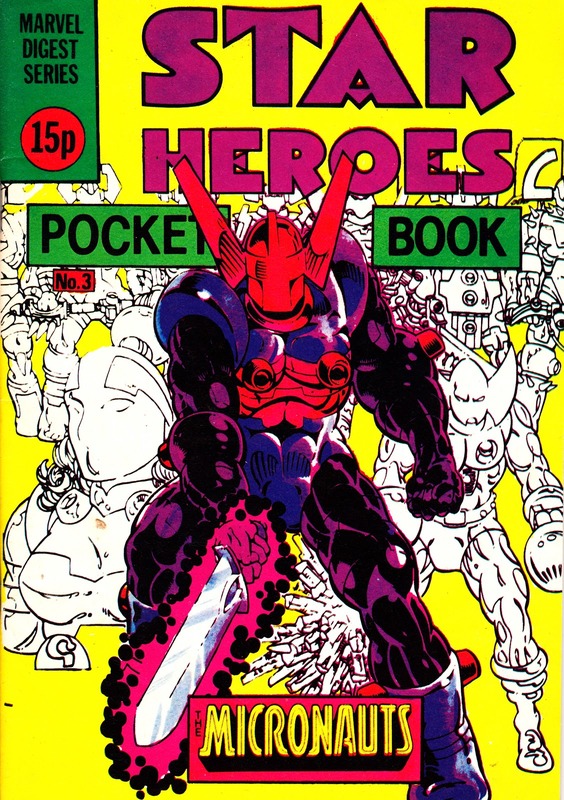 The renamed pocket book eventually clocked-up 28 issues before succumbing to the cancellation of the entire line (already pruned back in 1981) in '82. The same year, Marvel UK reran the same X-MEN reprints, albeit now in murky colour and at a larger size, again in X-MEN weekly (followed by THOR AND THE X-MEN and SPIDER-MAN). 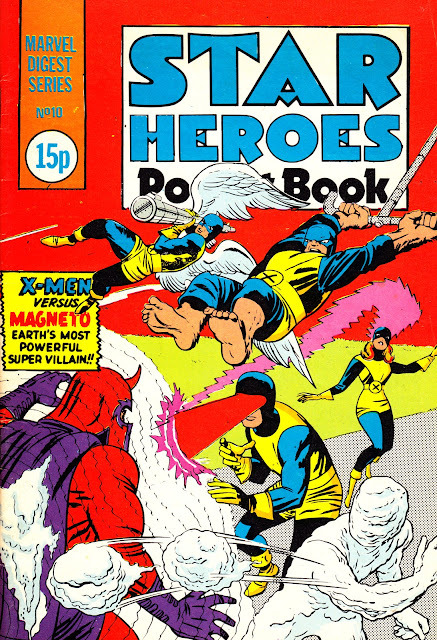 Not sure about this, but I have an inkling that the Lee/Kirby X-Men stories had also appeared in "Superheroes" Weekly from Marvel UK, circa 1975. The headline star of that title was Silver Surfer, while its back-up slots had a huge turnover of strips as they struggled to fill the pages. I never read Superheroes - it slightly pre-dates my reading - so I may be wrong. Great blog post, as ever, by the way. Always enjoy the nostalgic treasures you highlight here. Yup, you are absolutely right. I'd completely forgotten that one. Embarrassingly, I covered SUPERHEROES in a couple of posts last year. Silly me. 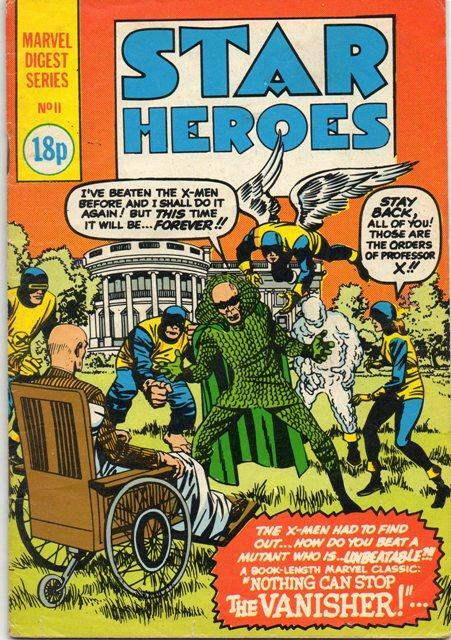 I don't have the issues to hand and I can't recall exactly what part of the X-Men run Superheroes dipped into. 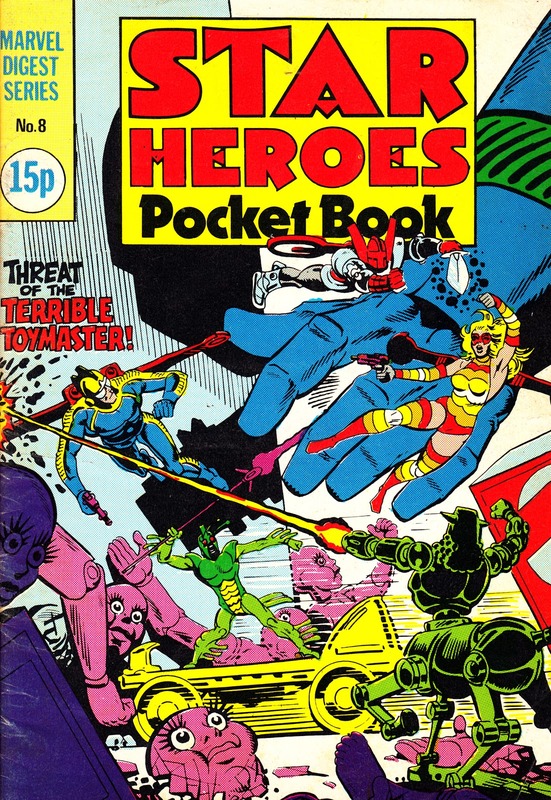 They didn't survive the merger with SPIDER-MAN (although Marvel smartly timed the reprinting of a guest-turn in the Spidey strip to coincide with the merger) but moved across (in January 1976) to THE TITANS. Thanks for the kind words about the blog, much appreciated! Marvel Superheroes, 1980. I don't have it to hand, but as well as X-Men #1 I recall it also included "We have to Fight the Avengers" from X-Men #9. If the latter wasn't in this, it certainly appeared in another annual of the same year. I missed most of these due to starting college and the financial restraints this caused. Nice to see this glimpse of the stuff I never saw. Thanks! I can think of the Original X-Men being in both the Titans annual, plus a couple of very nice Grandreams solo annuals.